Although it may appear to many that Marlin have been a bit quiet of recent, we have in fact been really busy behind the scenes with all sorts of projects, and wanted to let everyone know that we are still here and working extremely hard. Building, developing and finishing new Marlins. During 2016 we created an exciting new rear mudguard design and light assembly for the Sportster to comply with the latest set of IVA rules and regs. These have now been fitted to all the latest cars we have finished and are also available as a retro-fit item. We are also developing an opening rear boot for the Sportster which we will be announcing as soon as it is available. Fed up with being pushed around? 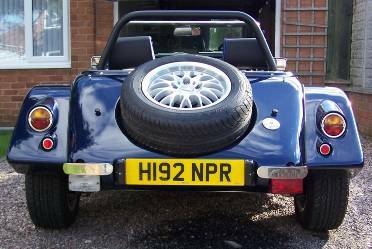 Customers have been reporting the Sportster rear roof panel usefulness as an Anti-Buffeting screen from wind turbulence when top down motoring, so we are now selling this panel as a separate item, but please note it is only suitable for Sportsters fitted with full width roll bars. If you look closely at this workshop photo of a customers Sportster which was booked in to have the new design rear mudguards fitted, you can see the pop-on Anti-buffet rear screen which is now available as a separate item. The original Sportster roof was a design conceived by Mark and only intended to deal with light showers, however we have recently been busy developing an improved roof system capable of dealing with heavy weather and are intending this will be ready by late spring … in time for the English summer! 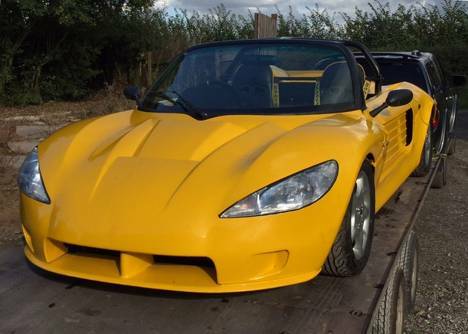 During the year we have been pleased to be able to assist customers who are building kit cars by offering our expertise to complete any finishing touches where required, and also to take cars through the IVA accreditation process. Should customers require our assistance with any of these services and do not have means of transportation, we can also pickup and deliver your car door to door. This yellow 5EXi was finished off for its new owners, inspected for roadworthy-ness and checked for legality before taking for IVA accreditation. This superb red Sportster was picked up from London and brought to the factory for our expertise and knowledge. 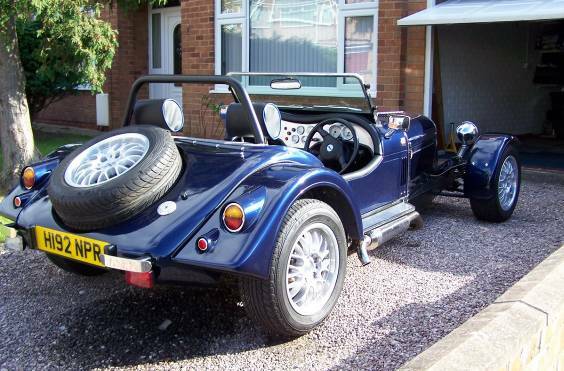 It was given a thorough factory check, then fully serviced, had its general setup tested and also given an MOT. Amongst our other regular tasks we frequently get asked to take on restoration work for some of the older cars that have had a tough life. One such car was this rather tired blue Hunter, which will certainly benefit greatly from some serious factory applied TLC. It was once very loved and used daily, unfortunately the owner fell ill and after a long and sad demise when the car stood unused for many years, it was bequeathed to a dear nephew who now wishes it fully restored to original condition in memory of his uncle. Design, development and manufacturing work for other car companies. 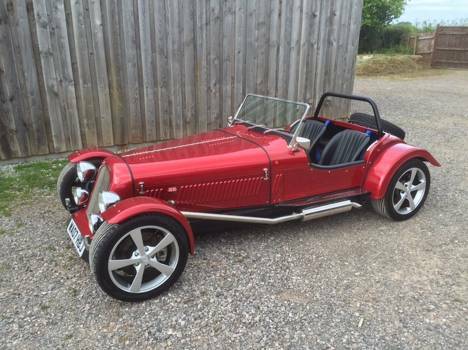 During 2016 we have continued building chassis and body parts for various other car manufacturers which include Chesil Speedsters and Suffolk Sports Cars. What we can also reveal is the development work we have been involved in with Avatar’s new sportscar, the Avatar Roadster. Our input involved participating in the design and build of the air-flowed road hugging body shell and also creating an entirely new chassis design which has been thoroughly tested with impressive race leading performance on the track last season. 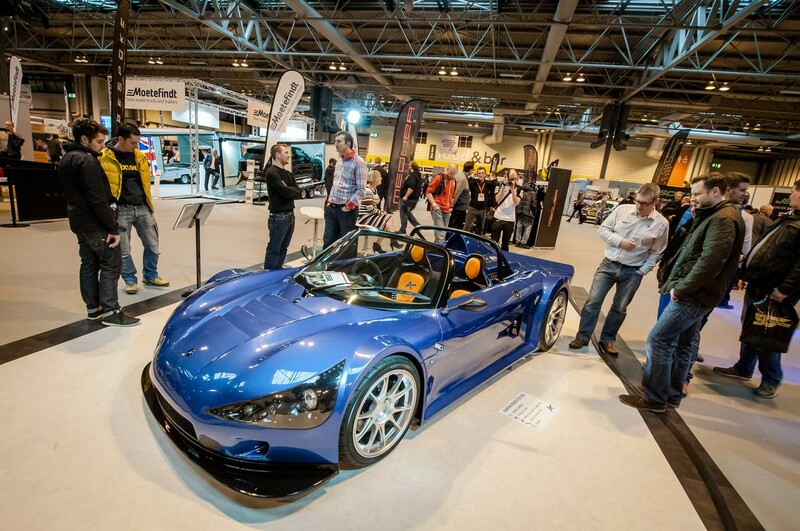 The first road legal demonstrator was also assembled in our workshops and presented to the public and the press at the Autocar International Race & Sportscar Show at the NEC during January 2017 to great acclaim and many test drives have been booked already. And of course - we are still producing plenty of kits. 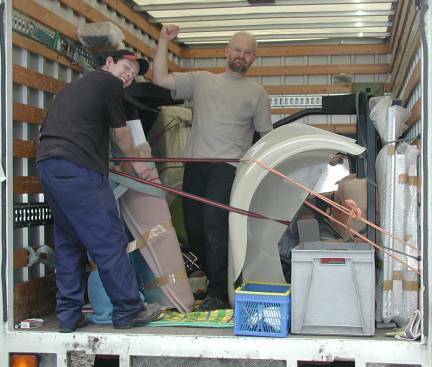 Sportster and 5EXi kits are still a big part of our business. Our beautiful purple ex-demonstrator Sportster was turned into a Left-Hand-Drive model for Romania and also had to have a 2ltr engine retro fitted instead of its BMW-M3 unit, to comply with their laws which makes large engines very expensive to tax. Snow is no excuse to put the roof up… for some ! Above: We were delighted to see that this Marlin owner, who lives in Sweden, was not going to let a bit of the white stuff prevent him from enjoying some top down Sportster motoring. We are very pleased to see that so many of our European friends are now appreciating the pleasures of owning a bespoke Marlin. 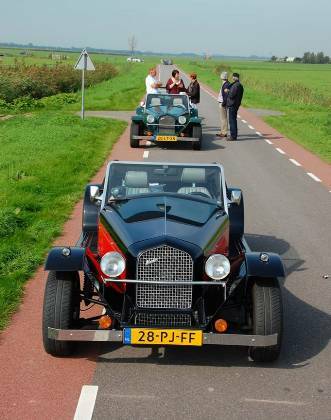 Left: A pair of Dutch Cabrio’s take a break during a rally in France. Above: An Austrian Sportster posing for a photo beside an unfenced railway line! Right: A Marlin Hunter taking in the wonderful scenery in New Zealand. What a beautiful sight – and the mountains and scenery look quite good too! How do you like your Sportster? One model but two distinct styles - Can you Spot the Differences! This pair of Sportsters are owned by a father and son. Struck by certain similarities between the Marlin Sportster and an exotic pre-war Alfa Romeo, dad decided to go retro and pimp it up with a bonnet strap, low cut screen, traditionally style ridged cycle wings, chrome trim around the front grill, a radiator filler cap and top it off with an Alfa badge. The son however decided to keep his as a modern classic. Mark’s 5EXi race car sold. We are pleased to announce that Mark’s race car has been sold. As you can imagine it was very tough letting it go, but we are thrilled that it has gone to a good home and will shortly be Hill Climbing in Devon. Right : Mark's Marlin factory 5EXi race car in its final race developed guise. During 2016 Marlin were invited to meet the Chinese trade delegation when they visited the UK. 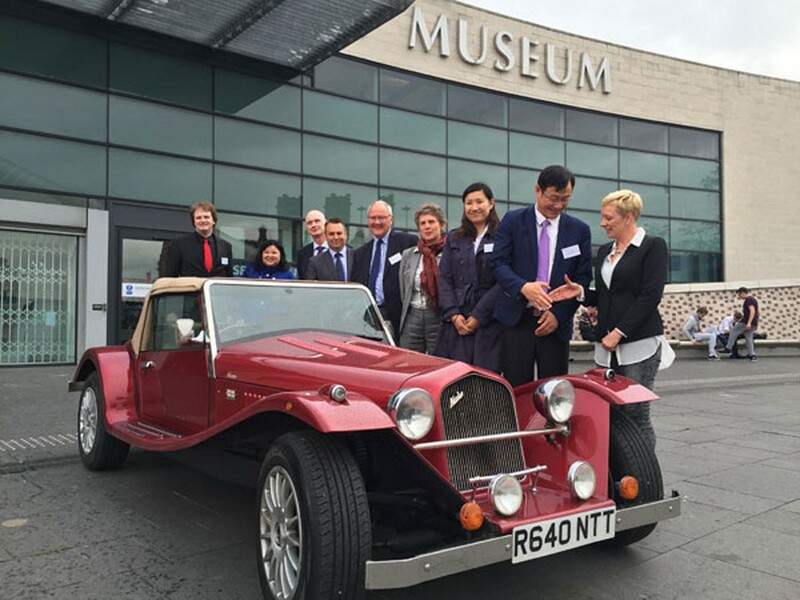 Below: Marlin company director Terry Matthews (far right) greets one of the Chinese delegates outside the Transport Museum in Coventry, whilst displaying a fabulous example of their classic Hunter. Right: Georgie & Spike continuing to keep a close eye on the goings on! Kevin: Originally arriving as a trainee, Kevin has now been with us for nearly 25 years. In that period he really has become a true master of many skills and is now our chief chassis developer and engineer. Nick: Joining our team nearly two years ago Nick is a bright young man, very enthusiastic about all things car and currently when not working hard at the factory is studying engineering at college one day a week. Russell: We are very pleased to welcome glass fibre specialist Russell into our team at Marlin, he has been with us for a few months now exercising his bodywork expertise and has settled in well. Terry: The boss, always with a finger on the pulse. Terry not only deals with all customer queries, company finances and marketing issues, she also oversees all operations on the workshop floor. We are very proud to be working with the Marlin Owners club and wish to say a BIG THANK YOU for all your support. The club is grateful that it receives plenty of pictures and stories from Roadster, Berlinetta and Cabrio owners, but would really appreciate it if owners of Hunter, Sportster and 5EXi models would also send in pictures of their car with some details - and preferably a few words if possible, - for inclusion in future copies of the excellent Marlin Owners Club magazine. 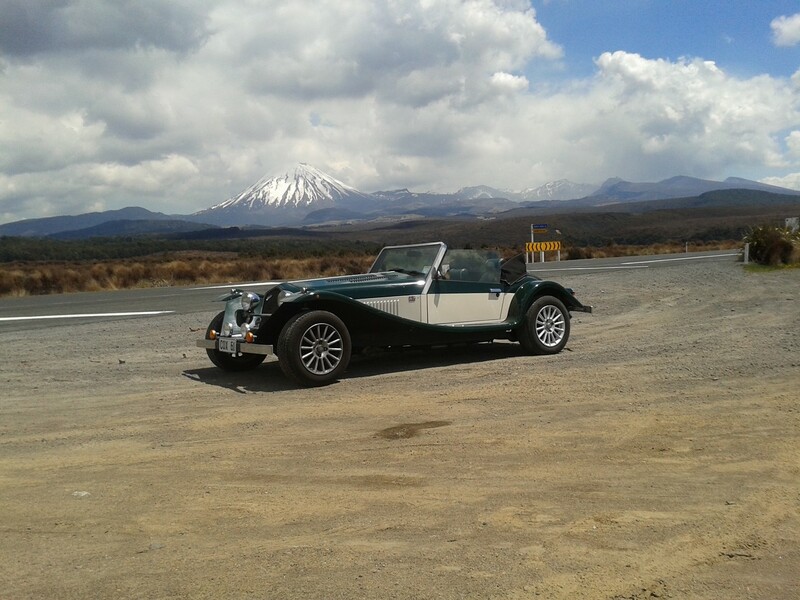 … have kindly sent us photos of their cars and tales of adventures for inclusion in our newsletter and in various other places throughout the year. It is always very much appreciated, and we enjoy seeing them – so please keep them coming. After managing to hold our prices steady for six years, unfortunately we will now have to increase them from the 1st March 2017. So if you were thinking of placing an order within the next few months, it would be wise to get your order in now! 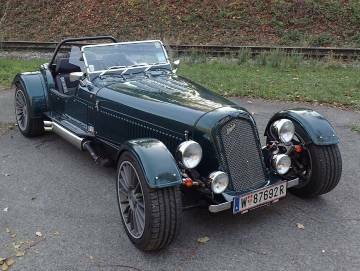 We are finishing two customers cars, - one a BMW Sportster and the other a V8 Cabrio, - various kit orders and also some general engineering and glass fibre work for other companies. We are determined to finish Mark’s turbo diesel powered Marlin Sportster with the intention of taking it to the Stoneleigh International Kit Car Show. 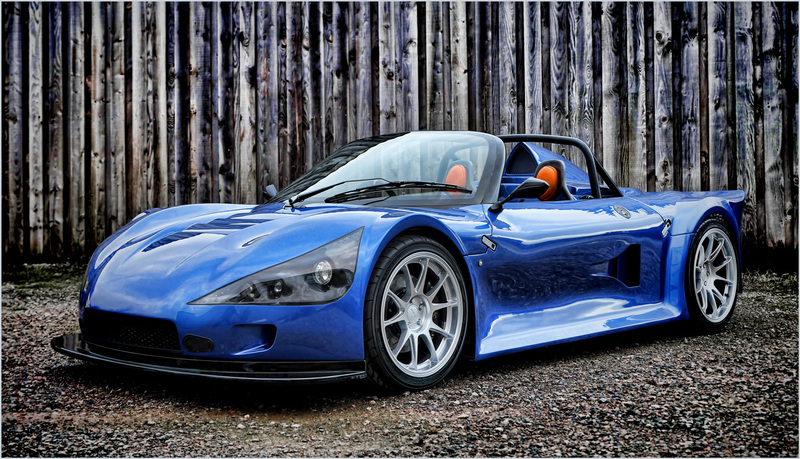 As well as organising various track events we will be planning to take the Avatar Roadster to the MIRA proving grounds. And last but not least, we are now booking in customers cars for Spring.